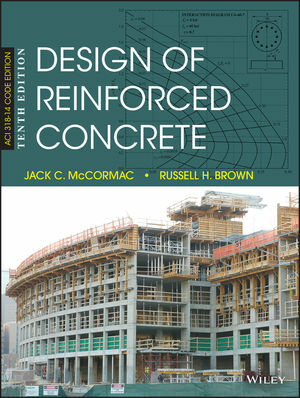 Design of Reinforced Concrete, 10th Edition by Jack McCormac and Russell Brown, introduces the fundamentals of reinforced concrete design in a clear and comprehensive manner and grounded in the basic principles of mechanics of solids. Students build on their understanding of basic mechanics to learn new concepts such as compressive stress and strain in concrete, while applying current ACI Code. Updated Code. With the tenth edition of this text, the contents have been updated to conform to the 2014 Building Code of the American Concrete Institute (ACI 318-14). Changes to this edition of the code are discussed in Section 1.7 of the text under the heading Summary of 2014 ACI Code Changes. Chapter on Concrete Masonry Updated to ACI 530-13 Code. The new chapter on strength design of reinforced concrete masonry that was added to the ninth edition of the text has been updated to conform to the 2013 issue of ACI 530. Grounded in the basic principles of mechanics of solids, so that students build on their understanding of mechanics to learn the new concepts of reinforced concrete design. Updated content, examples, and problems in accordance with code ACI 318-14. Excel Spreadsheets: Use of Excel spreadsheets for examples provides the student and instructor with tools to analyze and design reinforced concrete elements quickly as well as compare alternative solutions.